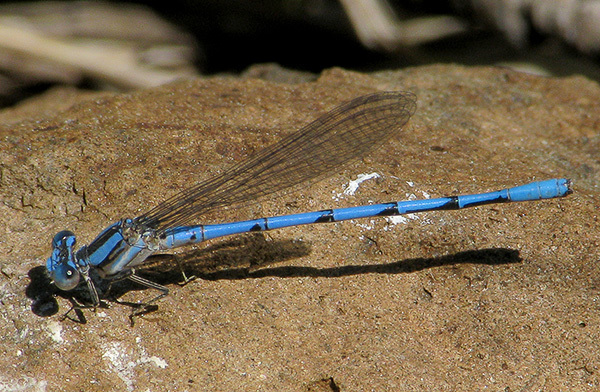 The Aztec Dancer, Argia nahuana is a common species in many regions of Arizona. In males, the abdominal segment 6 (S6) is normally blue with a black posterior ring and S7 is mostly black (Paulson, 2009). 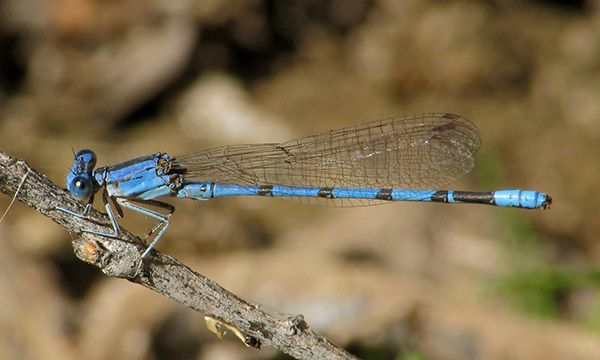 In June 2009, however, one male with unusual coloration was observed and photographed at Bog Tank, Apache. This individual showed extensive black coloration ventrally on S6 and black coloration on S7 that was for the most part limited to the ventral aspect of this segment (see Aztec Dancer page). Similar individuals were reportedly observed at the same location also during the summer 2007 Dragonfly Society of Americas annual meeting (Dennis Paulson, personal communication) and more were seen and photographed in June 2010 (see Aztec Dancer page). Thus Bog Tank holds a phenotypically unusual and apparently stable (over time) population of Aztec Dancers. The geographic extent of this population and whether it intergrades with “regular” individuals at nearby locations do not appear to be known. Male Aztec Dancer: Bog Tank, AZ, phenotype. Bog Tank, Apache, AZ, 18 June 2009. Note the differences in color pattern of the abdominal segments between this and the other individual. The extent to which this pattern is characteristic of the Bog Tank population is not known.